French Onion Soup - A Sop Story - Kosher In The Kitch! 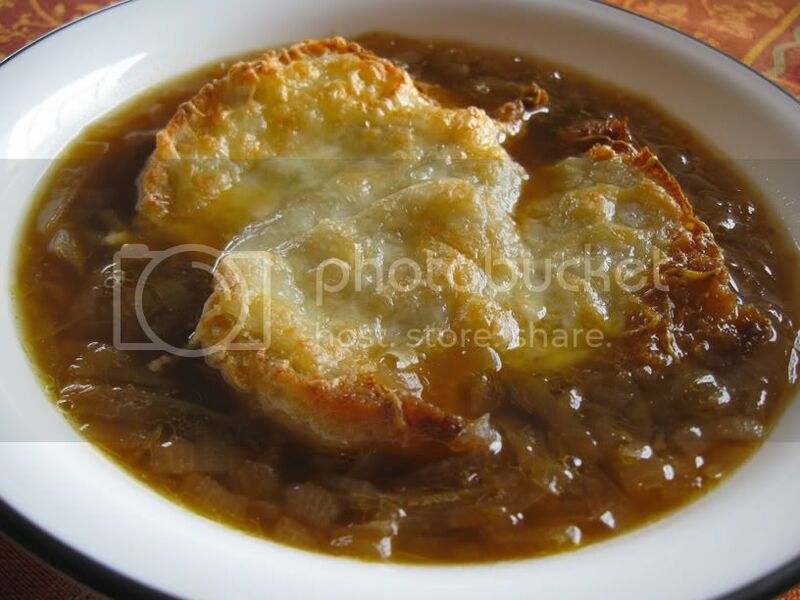 French Onion Soup - A Sop Story - Kosher In The Kitch! It’s a common misconception that French onion soup is meat-based. Although this may be common today, French onion soup traces its roots back to quite vegetarian origins. One of the oldest known soups of the world, we can trace onion soups back to Roman times (possibly even earlier), where the ingredients were simply onions, butter, water, and bread. Over the years, seasonings varied in quantity and complexity, but the core idea, astonishingly enough, still prominently remains. In fact, today’s methods for making onion soup haven’t changed much from when the Romans made it centuries ago. Incidentally, what we know as onion “soup” is actually not what we historically know as a “soup” at all, but rather, a sop. Onion soup in particular rings very true of this original idea of a sop, which is broth served over a thick slice of bread. The bread would then “sop” up the liquid, thereby making it easier to eat. In a time where spoons were sometimes optional (read that as “unavailable”), the piece of bread was instrumental in making soup work, because it proved to be a very good way to both contain and eat the broth. The key to good, rich, onion soup lies in the caramelization of the onions. The caramelization process does two things: first, it drives out excess water, which does not add much flavor to the soup, and second, it brings the onion’s natural sugars to the surface. Heating these sugars slowly causes some chemical changes to take place: really yummy chemical changes. We find evidence of this change in the appearance of the sticky coating, or fond, left behind on the bottom of the pan. In fact, some French chefs will spend the good part of an hour on this process, alternating between stove and broiler, to achieve the darkest color, and most complex flavor possible. No, it doesn’t have to be this way. Although the idea of achieving new levels of caramelization excites me, I’m ultimately much too impatient to wait this long for soup. Below is an easy, quicker (but not speedy) version of onion soup. I’ve added Bragg’s Liquid Aminos and nutritional yeast to the soup for extra nutrition and complexity of flavor, but you can feel free to leave them out, if you wish. 1) Heat margarine in a pot on medium heat. Add onions and sprinkle with some Kosher salt, stirring onions occasionally. The role of the salt in this step is not for seasoning so much as to help draw the water out of the onions faster. This speeds things along a little bit. After the liquid evaporates, pay watch the onions carefully so that they do not burn. You may want to turn the heat down a bit during this stage to help prevent burning. Add garlic, and continue to stir until onions are a uniform caramel-brown color, and a fond accumulates on the bottom. 2) Add hot water to the pot to deglaze the pan, scraping the fond off the bottom of the pot to dissolve it into the water. This is your soup stock. It should have a pretty tasty oniony flavor that will get better with some more simmering and reducing. 3) Add seasonings to the soup (yeast flakes, tamari, liquid aminos, ground pepper, and more salt, as desired). Be careful not to over season the soup at this point, since it will be simmering for a little while. We season now to draw out some more flavors locked in the onions. Cover pot and simmer about 30 – 45 minutes. Test and adjust seasonings to taste. Place thick slices of crusty bread onto a baking sheet and top with shredded cheese of your choice. Traditionally, Gruyère cheese is used, but one can substitute Swiss, Gouda, Muenster, or even Mozzarella, if desired. For a treat, try aged, goat’s milk cheddar. Place cheese-topped bread into a hot broiler and broil until cheese is slightly browned and bubbly. (Alternatively, if you have oven-safe crocks, feel free to place the bread into the soup, top with cheese, and place the whole crock into the broiler.) Place cheese covered bread into individual soup portions and serve immediately. Place a toasted slice of crusty bread into a soup bowl, and ladle hot soup over it. Serve immediately. MMmmmm – sounds delicious, and this is one of my favourites! Have you ever tried beer instead of part of the water? It seems like it would add a similar note to the yeast. Last time, I replaced ALL the water, which was a mistake, so I’m still searching for the perfect ratio. I would happily take recommendations! Just as an aside, nutritional yeast flakes don’t really taste much like beer at all. I keep them around because they are great for giving a somewhat “meaty” flavor to parve or dairy items without adding the meat. My standard chicken stock substitution is 4 cups water, 1 Tbsp nutritional yeast, salt and thyme. For Beef broth, it’s 4 cups water, 1 Tbsp nutritional yeast, 2 Tbsp low sodium tamari (or soy sauce, to taste), onion powder. I’ll leave a post soon about how to make parve cheese with the yeast flakes…great for cheese steak sandwiches! I’m new to your website and loved the picture of the onion soup. I just don’t know what nutritional yeast flakes and liquid aminos are or where to buy them. Thanks. You can pick up both nutritional yeast flakes and liquid aminos at just about all health-food stores (Wild Oats, Sprouts, Henry’s, Whole Foods, etc.). Fairway or larger grocery stores usually carry at least the Liquid Aminos. Both products are produced by a company called Bragg’s (http://www.bragg.com/) and are OU certified. If you can’t find those ingredients, you can use a prepared parve or beef broth instead (just remember to make adjustments accordingly with the cheese if you choose to use meat broth). Also check Amazon.com for the Bragg’s products…sometimes you have to order in bulk, but if you like the products, it does save time and money. Sounds yummy. Will try it next weekend. Another topic…I am looking for EASY Kugel Recipes for Pesach. Maybe some that I can make the day before and just reheat before the first Seder. Any suggestions?